I’ve long thought the Toyota RAV4 was a solid and dependable ride for everyday driving. But with the new 5th-generation model due out for the 2019 model year, the RAV4 isn’t just a good vehicle, it’s a great one. 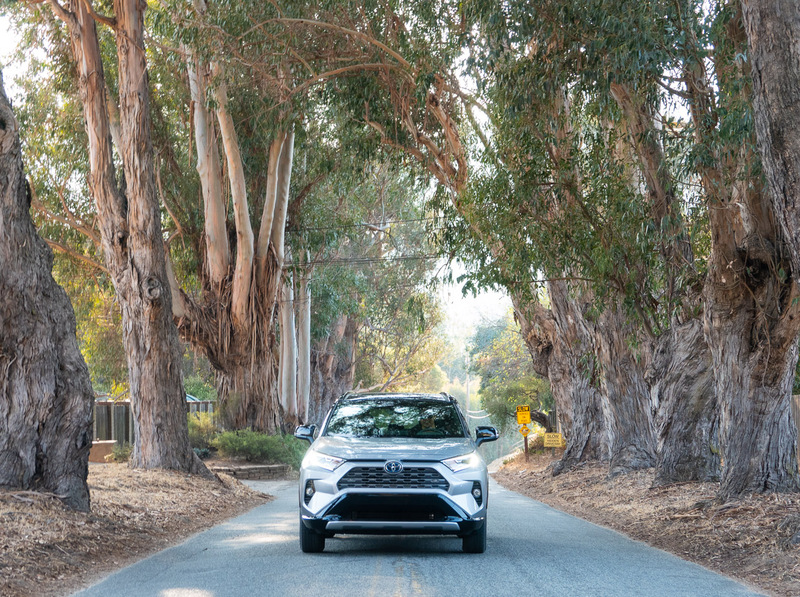 For the new model, Toyota redesigned its wildly successful compact SUV from the ground up, with a bold new look, a new architecture, new mechanicals, and tons of new technology. 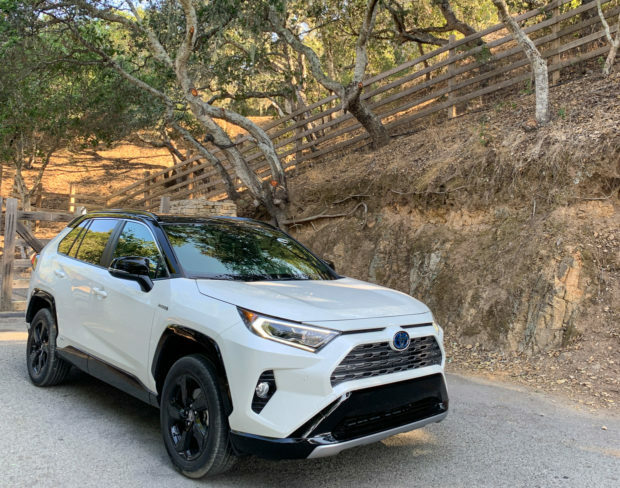 Starting with the exterior, the RAV4 has a much more masculine look than before, which should help expand its image beyond family grocery getter. 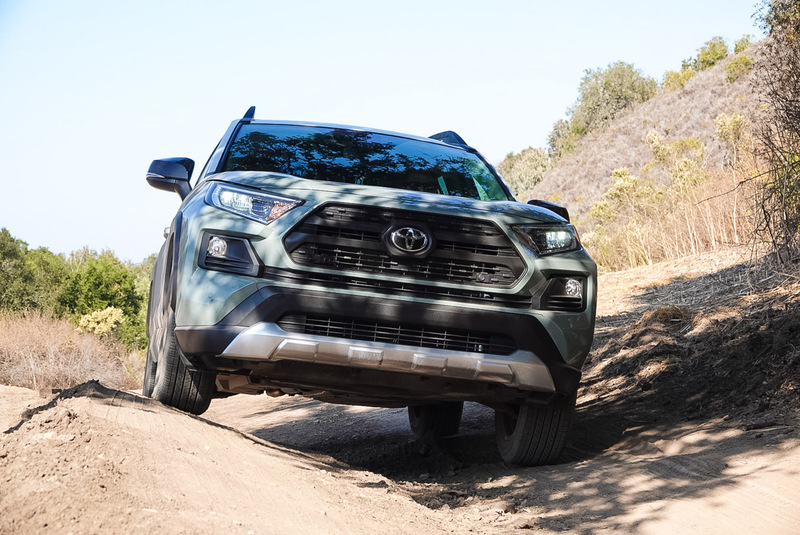 Toyota has incorporated the chiseled front end found on its truck lineup, and melded it with an angular new side profile that’s every bit as sharp and dynamic as a Range Rover Evoque. The RAV4 comes in three main looks – the more conservative LE/XLE/XLE Premium/Limited, the sporty XSE HV, and the rugged Adventure trim. 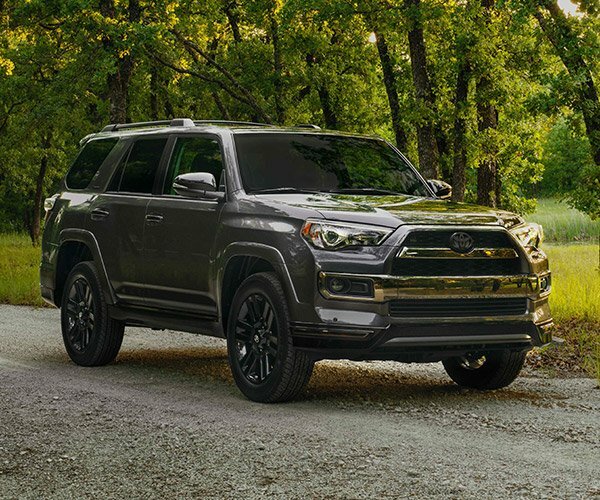 Both the XSE HV and Adventure models offer a two-tone paint combo, which looks great in either Midnight Black metallic, or Ice Edge, which is exclusive to the Adventure, which get a special grille that looks like it was stolen directly from a Tacoma pickup. Without adding to overall length, the new RAV4 sees substantial changes in its overall proportions. Its wheelbase gains 1.2″, its front track is 1.2″ wider, its rear track 1.9″ wider, and the overall vehicle is 1″ taller and 0.4″ wider than before. 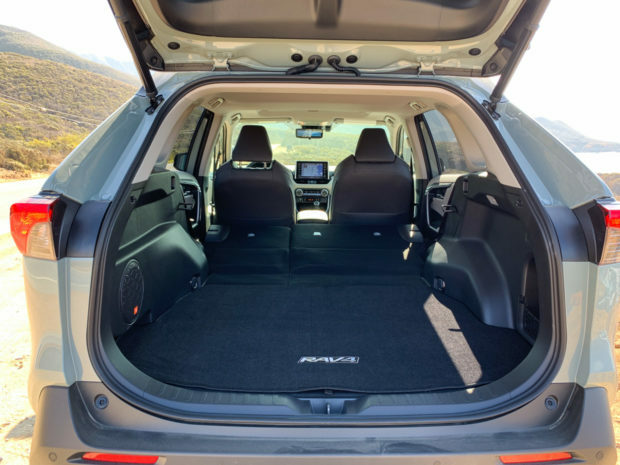 Of particular note is the increased maximum ground clearance, which now stands at 8.4″ to 8.6″, a 2.3″ increase over the outgoing RAV4, and a welcome upgrade for anyone who wants to take their SUV off road. That’s an impressive gain, given the fact that its center of gravity has actually decreased. Under the hood, every RAV4 gets a DOHC 2.5-liter “Dynamic Force” 4-cylinder engine. It’s tuned to makes 203 hp and 184 lb-ft. of torque in the gas model, and 176 hp and 163 lb-ft. of torque in the hybrid. But don’t let those numbers fool you – combined with its electric motors, the hybrid is the overall more powerful version, with a total of 219 net horsepower. Not only can you feel that extra 16 hp under foot, but the real difference is how much the instantaneous torque of the motors helps the hybrid zoom off the line with more fervor, while being a quieter drivetrain overall. The gas engine is by no means a slouch, but it does get a little more growly under hard throttle application than the hybrid does. Both drivetrains feel substantially more peppy than the prior gen RAV4. The big story with the hybrid is that it manages a combined 39 mpg, compared to the gas model’s 29 mpg. Plus, the hybrid RAV4 is just $800 more than its gas AWD equivalents, and has identical cargo and cabin space. In other words, there’s very little reason to consider the gas version. 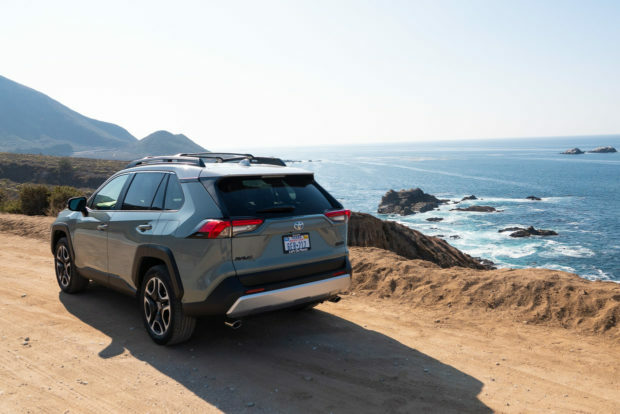 Though there is one… if you are considering an AWD model, the gas RAV4 Limited and Adventure models come with a torque-vectoring rear differential. This means that it can send power independently to each of its rear wheels, which improves overall cornering, and can be a help in some scenarios where one wheel can’t get traction and the other can. On the other hand, if you go with the hybrid, it can send up to 80% of torque to the rear wheels, while the gas AWD can only go as far as 50%. In my time behind the wheel, the most notable difference was that the gas model felt just ever so slightly sharper when cornering than the hybrid. Most buyers will never notice the difference. Speaking of handling, the new RAV4 is more agile than ever, thanks in no small part to its move to the TNGA-K platform – the same architecture that underpins the new Camry and Avalon. 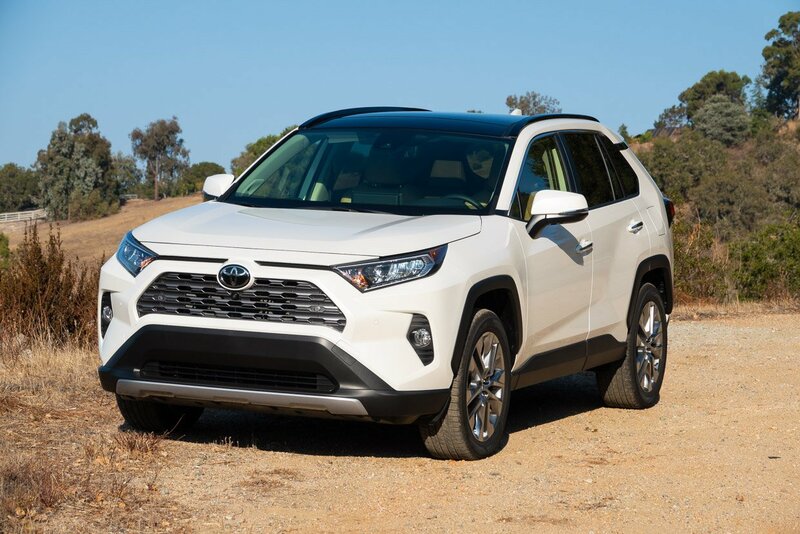 In prior generations, the RAV4 had more in common with the subcompact Corolla, and with the move to the new platform, it just feels more substantial. The steering is much more responsive this time out, with very little play in the wheel. Toyota’s engineers moved the electric assist motor tor the rack, which definitely helps provide a direct feel. 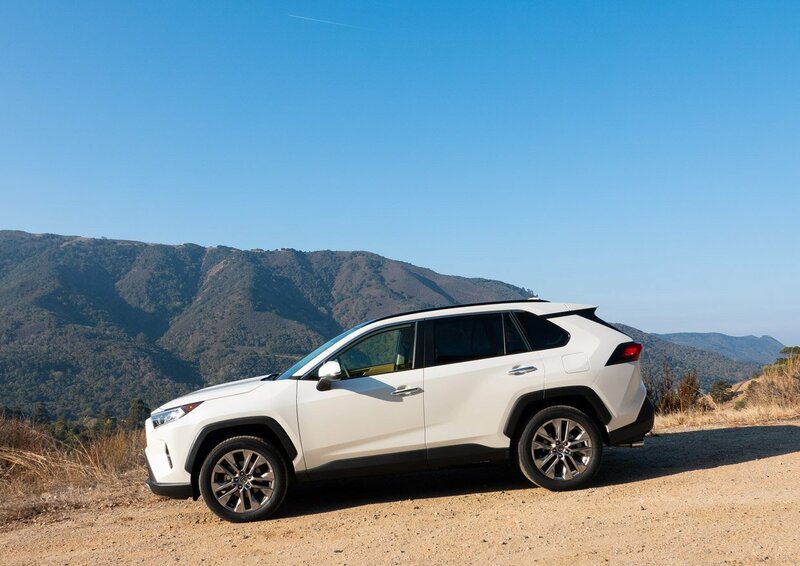 The chassis and suspension help smooth out bumps better than ever too, and the word “harsh” has been 100% banished from the RAV4’s vocabulary. Everything feels well sorted in the suspension, and it’s well-mannered when cornering or changing directions rapidly, keeping body roll in check. Those who opt for the sporty XSE HV get their suspension tuned just a little bit more firmly than other trims. The interior of the RAV4 has seen big upgrades too, with a more purposeful and cohesive design. It can be had for the first time with a panoramic glass roof, and its front section offers power tilt and slide. There’s a 7″ or 8″ touchscreen front-and-center in the dashboard, along with digital instruments in the center of the gauge cluster (on XSE, Limited, and Adventure models) which can display some nifty graphics about wheel slip, and where the AWD system is sending power. I did notice that this display had a tendency to wash out in bright sunlight more often than I’d like it to, and since there’s no analog speedometer, it’s an occasional source of frustration. Oddly enough, the display on the touchscreen exhibited no such behavior. There’s lots to like about the cockpit, from the smart use of multiple material textures and tones to break up surfaces, and well-placed, tactile controls throughout. 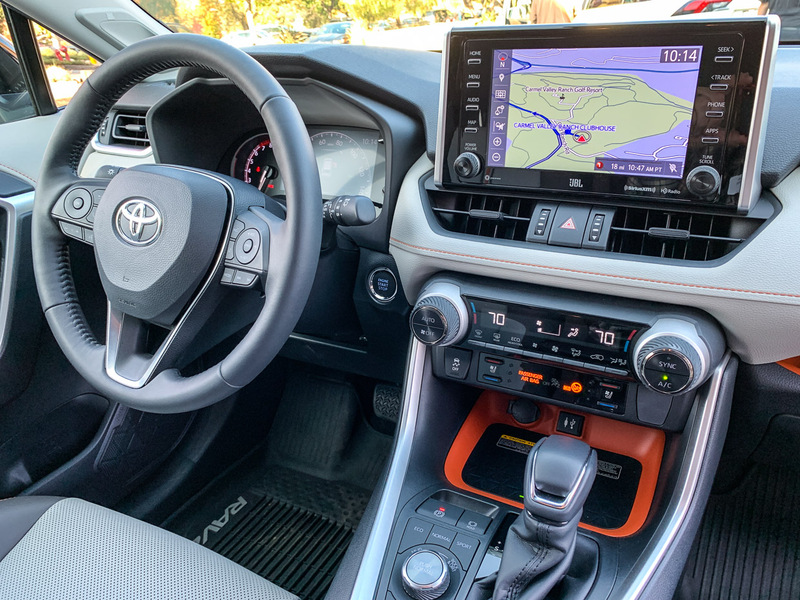 There’s a good amount of storage in the center console and doors, and a feature that I loved on the Highlander has made its way to the RAV4 – a large shelf on the passenger side that’s perfect for smartphones and sunglasses. The optional Qi wireless charging pad benefits from a large enough tray to hold even the biggest phones and phablets – fixing a common issue with other wireless chargers. If you prefer to plug in, there are ample USB charging ports – five in all – one in the center stack, two in the storage bin, and two for rear seat passengers. The Apple CarPlay worked great, and was the first time I’ve gotten to enjoy Waze integration in a car, something I’ve been clamoring for. There’s also Amazon Alexa tech, which lets you interact with the voice-based assistant for everything from checking the weather to ordering items, to controlling smart home appliances. The available 11-speaker, 800-watt JBL stereo system simply sounds fantastic, with bright and punchy sound, and no audible distortion even at high volumes. 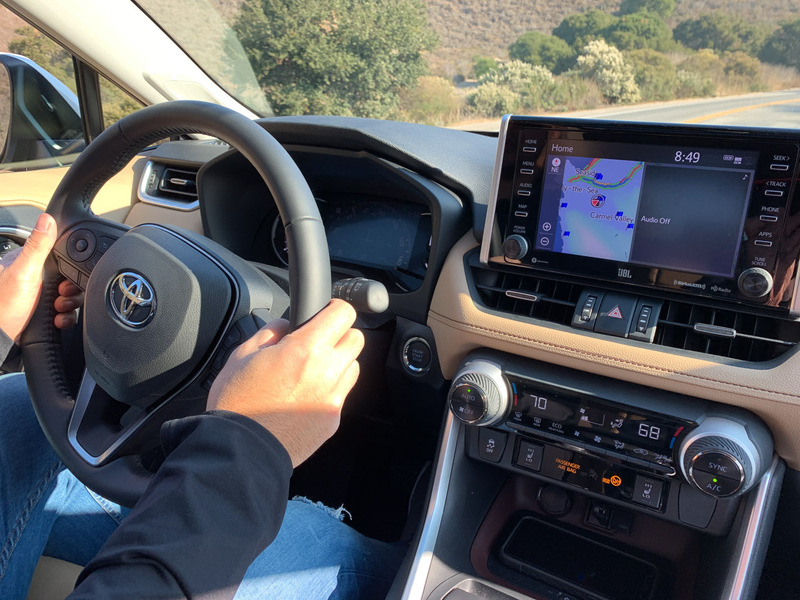 The cabin looks great and offers comfortable seating in the SofTex-trimmed color schemes in the XSE, Limited, and Adventure grade RAVs I had a chance to drive. I can’t speak to the less expensive fabric seats, since those weren’t on hand. Legroom is good for both front seat passengers, and not bad in the back seat even with longer legs. One strange quirk is that the front passenger seat offers no height adjustability, which results in limited headroom for taller passengers like myself. My head didn’t hit the ceiling, but it was an omnipresent feeling that there was something close to my head when riding shotgun. Toyota could fix this one minor fly in the ointment by offering an adjustable passenger seat as an option down the road. 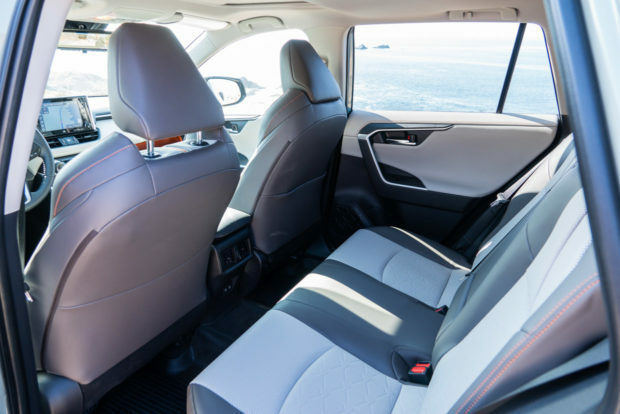 The front seats can be equipped with heat or heat and ventilation on the Limited model, and rear passengers can enjoy warm buns and backs too on that model. Toyota loads up the RAV4 with safety and convenience tech, starting off with Toyota Safety Sense 2.0 as standard on every single model. 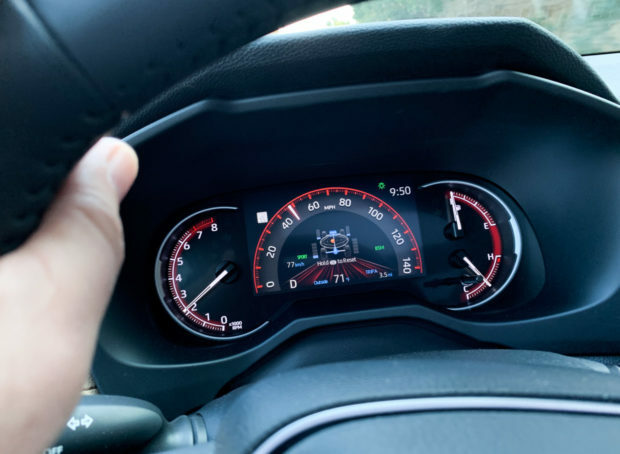 This system includes pre-collision alert and braking assist with pedestrian detection, daytime cyclist detection, lane-tracing assist, lane departure alert, automatic high beams, road sign assist, and full-speed dynamic radar cruise control. Blind spot monitors and rear cross-traffic alert are available as an option, along with rear-cross traffic emergency braking. 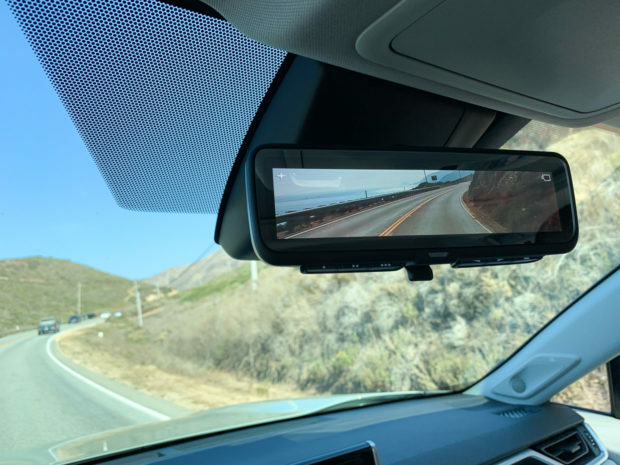 In addition to a bird’s-eye-view camera, you can also option out the rearview mirror with an LCD screen and rear-mounted camera that dramatically improves rear visibility and your field of view when driving. This feature has turned up on a handful of GM vehicles, but this is its first application on a Toyota, and once you get used to it, it’s hard to go back to a conventional rearview mirror. Part daily driver, part road trip adventure seeker, the RAV4 has ample cargo space, offering 37.0 to 37.6 cubic feet of space behind the second row, and substantially more if you fold the seats down. Toyota has yet to provide this spec, but suffice it to say, there’s plenty of room for hauling things. 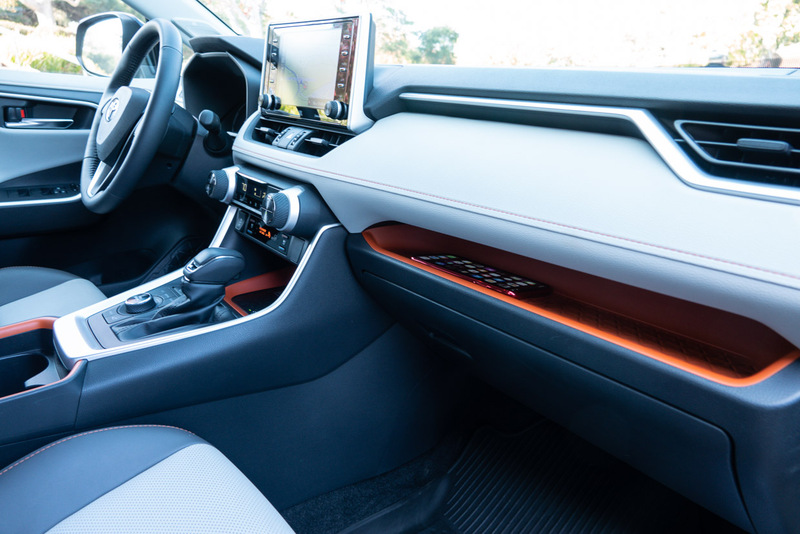 Plus, there’s no space penalty for hybrid owners, as Toyota has hidden the battery pack under the rear seat. While most of the RAV4 gas models can tow 1,500 lb, and hybrids can pull 1,750, the Adventure grade doubles that number to an impressive 3,500 lb, which should be more than enough for a pair of Jetskis on a trailer. 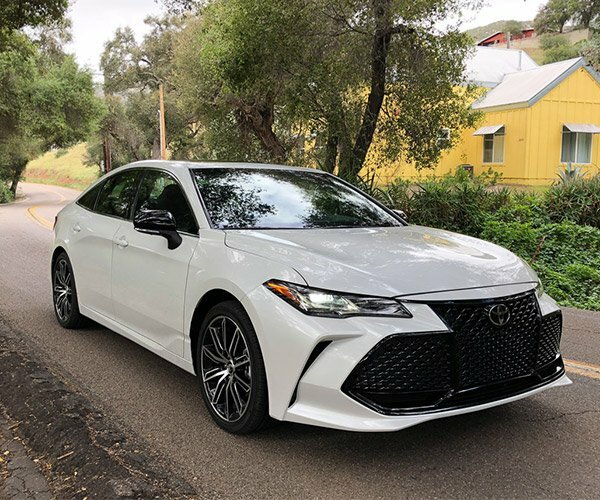 Toyota has taken its most popular car in North America and advanced it substantially for 2019. The new RAV4 looks great, drives great, is packed with modern technology, and is more capable than ever. 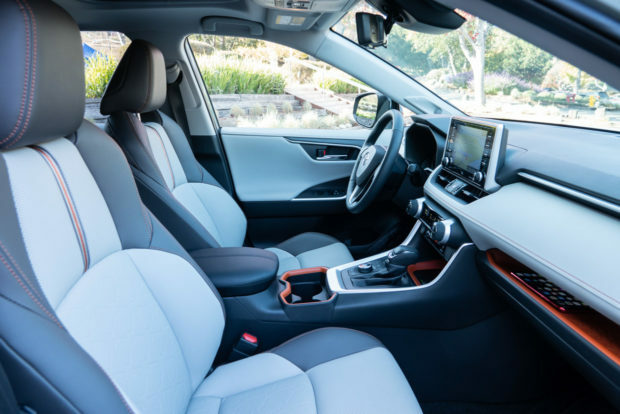 If you’re thinking about buying a compact SUV, you’ll definitely want to hold off on your purchase decision until you can take the new RAV4 for a test drive. Gas models hit dealerships this December, while the hybrids arrive starting in March 2019. Pricing for the 2019 RAV4 starts at $25,500 for the FWD LE trim, and tops out at $34,900 for the Limited AWD gas model. 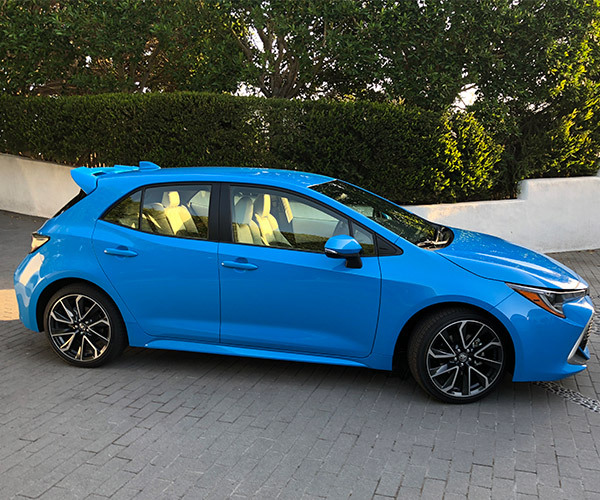 2019 Toyota Corolla Hatchback First Drive Review: Hot or Not Hatch?